Super Mario has his 20th anniversary this year. I had this first famicom and played Super Mario. I think I still remember which block I should push to get extra coins. 20 years have passed and now we can play Mario on Game boy micro, wow it's thin and small like a card!. When we hear this sound, we can say "It's Mario!!" soon. right?. Here is TV ad and you can see how thin it is. It reminds me of my first game machine "Game and watch". I had three Game and watches and I like I liked to play the fireman version. For 20th anniversary Nintendo made special design micros which collaborate with other companies. This one is the Cup Noodle version, this is the Fuji desposal camera version, this is the Tower Record version and I like this, the Kincho version. Talking about games, the Tokyo Game Show2005 will be held this weekend. In the Japanese webpage, they have a page"For Costume players". They prohibits thesecostumes 1. Policeman, fireman, Guard, Nurse. 2. dressed skimpily 3. Nazi, terrorists, 4. Big and long costume. 5. over 50cm tool, gun, sword, weapons etc,. Hmm Game characters and costume play seem to go together, like this Final Fantasy 3 guy. Maybe Mario Costume will be okay, it costs 12000yen! . 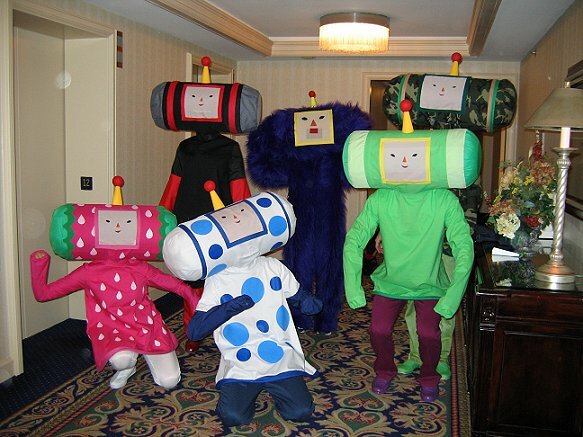 Prince of Katamari Damacy will be okay too if you're careful with your face when you walk. At the Tokyo Game show, there is a CESA ballot box corner. CESA is a big game Award in Japan which is decided by postal ballot. Yes it could be a gauge of a game's popularity. Last year's best game was Monster Hunter by Capcom. You can see Japanese TV ads and game promotion movie please check the site (sorry I don't know how to know link the URL of flash site ). The next mark games were Katamari Damacy, Onimusha3, Gyakuten Saiban3, grand theft auto 3　etc,. In Kanagawa Prefecture and some othres, The grand theft auto series are rated as a "harmful game". :-o. The Japanese game award was conferred upon Exciting Prowresling and the foreign game award was conferred upon Need for Speed Underground. This year's award will be announced in the end of October. After first famicom, I bought SEGA megadrive. I still play it from time to time on my Super Famicom (SNES) emulator on PC. Lots of fun! 20 years and people still playin mario (at least i do =) mari, can we change the game on game boy micro? or is it just 1 game thingy..? ouw.. the final fantasy 3 guy is actually wearing sephiroth costume.. it's from final fantasy 7..